Jan wandered over to the large Chinese supermarket only to discover it was a little like Costco. You need to be a member to purchase! No Chinese food for us…. Meanwhile Waiouru was in need of a 750 hour major service. This time I managed to avoid emptying the new engine oil into the bilge. The major service also requires the gearbox oil be replaced. I did what Adam (nb Briar Rose) had previously suggested and removed the drain plug from the bottom of the gearbox. It’s a quicker way to get the oil out of the gearbox but removing the waste oil container from the confined area under the engine is slightly more complicated. The disposable baby nappies made cleaning up the spills easier. We have two diesel pre-filters. The first had a few black specks in it and the second was clean so I decided not to change the fuel filter at this stage. However the air filter looks like it could do with replacing. Not having a UK address, we would usually buy the filters from a chandlery, but as we are now in London and youngest son has just arrived in the country, I did an online search finding the best prices at http://www.inlinefilters.co.uk/ I’ve now made up a matrix of compatible filters for fuel, air and oil. The automatic battery watering header tank needed topping up. Actually it took almost a litre of distilled water. The service had just been completed when Jan pointed out a boat was loose behind us and drifting in the strong wind. then we realised there were two bows. It was a breasted pair of of boats coming sideways down the canal towards us. I managed to get onto the boat moored behind us with our boat pole and hook the bow fender on one of the boats. That’s when the owner appeared. He told us he’d left the boats to go and do some laundry. 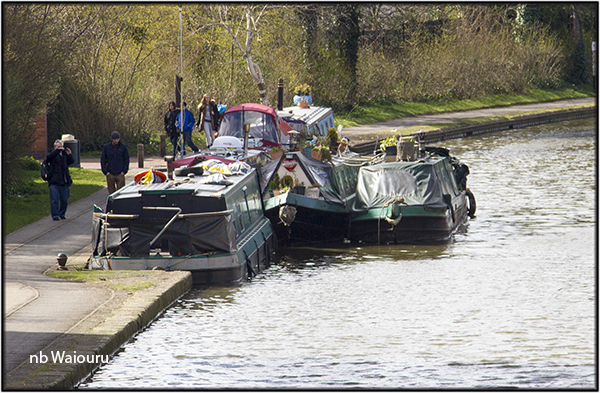 We helped the owner back onto his boat and in doing so noticed none of his mooring ropes were in the water and he didn’t appear to have used pins. It appeared he had relied on the wind to hold his boats against the bank. Eventually he told us he would breast up against Waiouru and go off to complete his laundry. So for several hours we were three abreast. Probably not unusual for London! 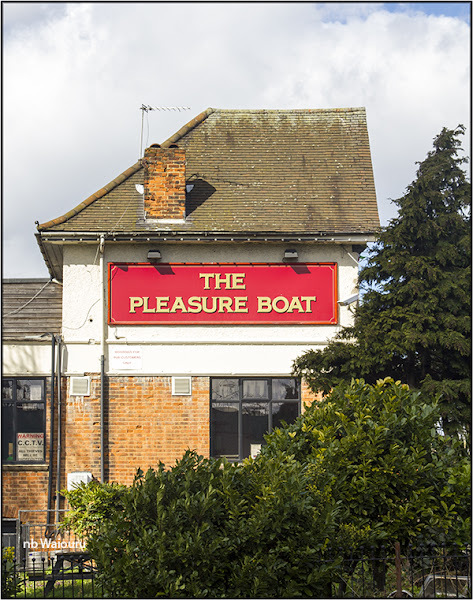 Having read about The Pleasure Boat (yesterday’s post) I wandered off to take a photo. From the canal it appears the pub has had the front cut off. 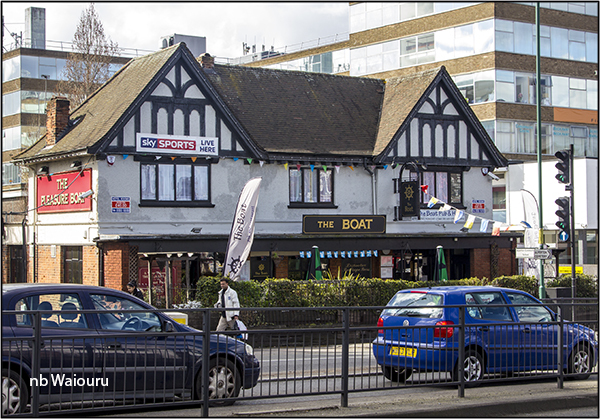 The pub fronts onto the busy A406 and I suspect the width of the road has significantly increased over the last 200 years. My initial thoughts were the front of the pub had been demolished as part of the road widening. But now I’m not so sure. It just looks strange side on. Now here is a sign that is observed more in the breach than compliance. Rather pointless having a sign if you have no means of enforcement. 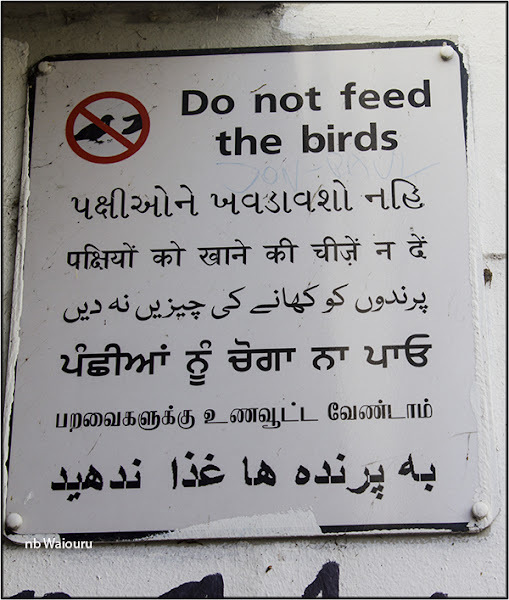 The water fowl around here a so well fed on unwanted bread that they get rather particular about what they will eat. I had not read this day when I posted my earlier comment.